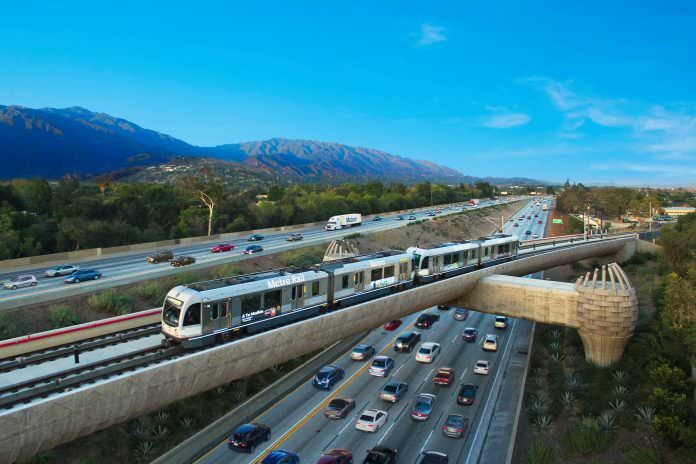 A stretch of the Foothill Gold line from Pasadena to Azusa. Credit: Foothill Gold line. The authority building Phase 2B of the Foothill Gold line has started the countdown to work after awarding a $2.6 million utility relocation contract. WA Rasic Construction was the successful bidder – as well as the first to be awarded a contract on the $1.4 billion project – and will now start work in October. The 12.3m extension will begin at the Metro Gold line’s eastern terminus at Azusa and terminate in Claremont – although Foothill Gold Line Construction Authority said that it may be extended to Montclair if funding from San Bernardino County is reached. The extension will include stops at: Citrus College, Glendora, San Dimas, La Verne, Pomona, Claremont Village and Montclair. For the first three years workers are expected to focus on relocating utilities, conducting pre-construction activities, finalising engineering plans and hiring a design-build contract team. The utility relocation contract is the first of two contracts to be procured as part of the Glendora to Montclair project. The second – the alignment design-build contract – will begin procurement this November and anticipate award in late 2018. Major construction will begin in 2020. The project is being funded by Los Angeles and San Bernardino counties.